The rickshaw, as westerners pronounce it, originated in Japan where it is known as jinrikisha – jin (man) riki (power) sha (carriage). Its basic design includes a carriage resting on two large-diameter wheels, a pair of long parallel poles joined by a crossbar, in addition to a removable hood which can be lowered or raised to protect the passenger against the burning sun or rain. It is hand-pulled and foot-run by the strength of one man who works in the front part, with the passenger sitting behind. There were two main categories of rickshaws in Hong Kong: those used by private individuals and those for public hire. The private rickshaws – then a prestige form of travel – were of the same standard design as the rickshaws for public hire; however, they were not all the same as they were made for each customer’s needs as per required specifications. The quality of the rickshaws for public hire also varied. 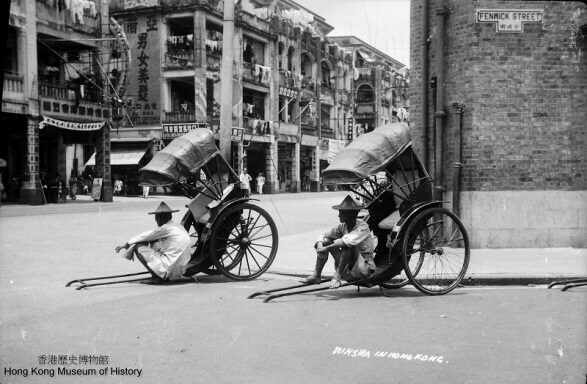 Therefore, rickshaws of different styles were used around Hong Kong at any one time. Rickshaws catered for the public for the first time on 22 April 1880. They became a popular form of transport which was nearly as convenient as that provided by taxis nowadays. Within two years of its advent, the public rickshaw appeared in great numbers which grew from “30” in 1880 to several hundred in 1882. In addition, an unknown number of private rickshaws were running around (The Hongkong Daily Press, 1 May 1880; The Hongkong Government Gazette, 3 November 1883). 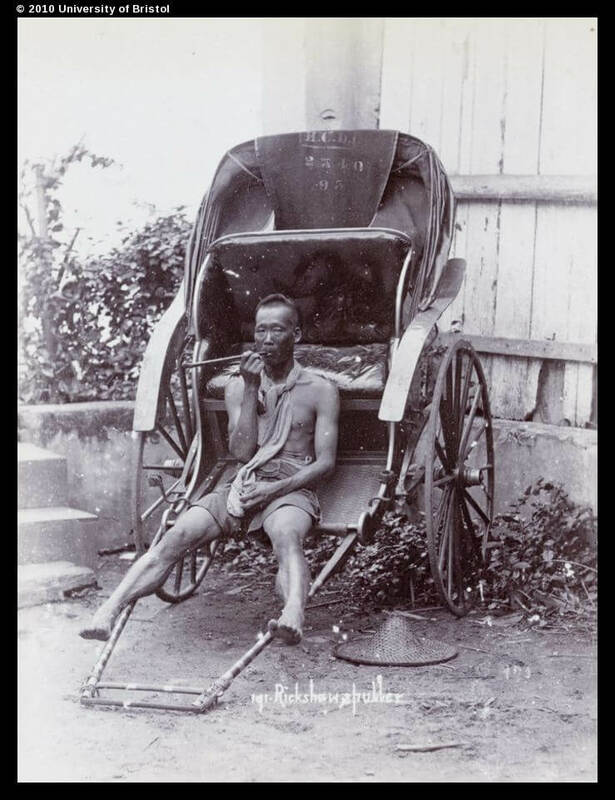 It will be seen that an improvement of the rickshaw services was no easy journey and Hong Kong moved rather slowly to replace wooden-wheeled rickshaws with new models to be fitted with rubber-tyred or pneumatic-tyred wheels. In May 1914, the Governor F. H. May and his aides “suggested that the question of providing by Regulation that all jinrickshas must have rubber tyres should be referred to the Captain Superintendent of Police.” (Minutes of Hong Kong Executive Council, read and confirmed by Mr. M. J. Breen, Clerk of Council, 23 May 1914). The next month, the Captain Superintendent of Police arranged with rickshaw proprietors to operate ten rickshaws with pneumatic-tyred wheels for public hire as an experiment. After three months’ use, the new rickshaws were worn out and taken off the city streets. This short article is about the efforts made to modify the design of the rickshaws used in Hong Kong, so as to make this means of travel smoother, more comfortable, and more suited to the local traffic. In this discussion, we have viewed many of Hong Kong’s “first” in history, such as who first introduced the rickshaw to the city of Victoria, the first type of rickshaw with a seating space of up to two adults, and the first of a type of rickshaw fitted with pneumatic tyres which continued in use until the 1960s when the traffic authorities decided not to issue any new licences and to renew existing ones until the man concerned no longer wished to continue his trade. By then, the rickshaw was on the way out overtaken by more modern means of transport. This article was first published in the Indhhk email Newsletter 8 sent out on 19th August 2013.